Whether you’re in need of a new furnace, ductwork or a new air conditioning system, Thomson AC is the right company for you. Our team of highly trained installers is clean and efficient. Our team will come out to your home. We will listen to you and understand your priorities, concerns and budget for your project. We will measure your home and inspect your entire heating and air conditioning situation. We will take notes and pictures of your property that allow us to design the perfect system for you. After we measure the home, we can begin the design of your custom HVAC system. Each home is different, and each customer has different priorities and objectives, so even the most seemingly basic of systems will be custom tailored to your home. Our team will run your design through our computer system and come up with an exact quotation for you. Each quotation will be detailed out with the complete scope of work and the exact price. There’s no guess work here. Everything is disclosed to you 100%. If you like the proposal that we’ve created for you and you’re ready to get your project moving, simply sign the estimate (digitally or in ink) and submit your 10% deposit. We can then begin to schedule up your installation. Signed estimates are important, as they ensure you have fully understood the included items and their associated costs. The deposit is what we use to hold your date on the calendar. It ensures we can pay for any city permits, restocking fees and delivery charges from the manufacture, if you decide to cancel. However, most of the time we are able to fully refund your deposit if you decide to cancel before your installation date. On the day of your install, we will often have all of your equipment delivered to your home. We try to arrive on site as close to 8am as possible. Our installers begin work at 7am, so depending on traffic, or necessary Home Depot or stops for gas, this time could fluctuate. Your installers are instructed to call you to notify you of their location and status when they are on the way to your home, so there are no surprises. Once on site, we will review the scope of work with you again to make sure we are all on the same page. We will discuss with you any preferences you may have, as well as any sensitive areas of the project that we foresee. We never want you to be “in the dark” about any part of our installation process. 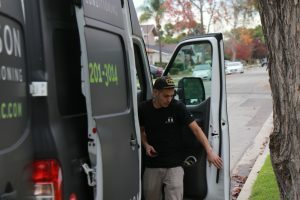 If the equipment wasn’t sent to the job with the installers for any reason, your installation team will oversee the delivery of equipment from the manufacture.